Are you looking for a free tool to cut and extract VOB clips from a DVD. You may download this free software called DVD Knife. DVD Knife is not only free but is simple and fast and has the ability to extract long VOB clips in a few seconds. By using this freeware, you can extract the DVD VOB in three simple steps i.e. “Select start”, “Select end” and “Save”. DVD Knife is a fast DVD Cutter and it can cut DVD in a few seconds. This freeware is easy to use and all it takes to Cut DVD is just three clicks. The freeware ensures that the quality of the clipped DVD VOB and the main movie is the same. The software neither compresses nor decompresses the DVD video to extract the clips. The extracted DVD VOB may be played and viewed using the Windows Media Player. 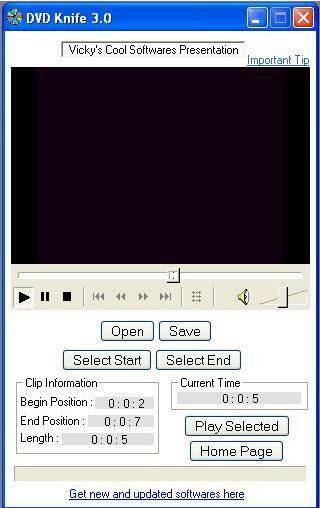 You can cut DVD of any length using this freeware. Free download DVD Knife, a free DVD cutter to cut DVD into DVD VOB of any length. You may extract any of your favorite scenes from the movies or TV shows you like as DVD VOB. To play and watch any DVD, you need to have the appropriate DVD codecs installed on your PC. You may also check out this Free Video Splitter to cut videos. Cut DVD and extract DVD VOB (DVD Video Object) with DVD Knife.